"Mr. Scott, an alien object of unbelievable destructive power is less than three days from this planet. The only starship in interception range is the Enterprise." From our vantage point on this side of the millennium and four different Star Trek TV series, it is nigh impossible to remember clearly just what the Star Trek universe was like in the 1970s. The Original Series was long since cancelled but had been revived in syndication. There was a less than satisfying animated series that had a short run on Saturday mornings. James Blish had provided novelized version of the original episodes to thirsty fans. Conventions were springing up around the country seemingly of their own will and fans endlessly debated the reasons why a new Star Trek series—or perhaps a movie—had not been made. Gene Roddenberry did bring an odd series called Genesis II to television, but it did not satisfy the Trekkers. Then came a space opera called Star Wars that changed the science fiction film world in the most dramatic way since Stanley Kubrick had brought 2001: A Space Odyssey to the screen. Suddenly, it was not only feasible to quickly bring Star Trek to the big screen, but eminently desirable. Plans had been in the works to create a new series and this effort was quickly retooled for a feature film. Most of the original cast were on board, with the notable exception of Leonard Nimoy, and many of the original technical crew were to be involved. The techs working on this movie were like a dream team of the best in the business; their work was groundbreaking and influential on subsequent science fiction movies as any film since 2001. Respected film director Robert Wise (The Sound of Music, The Sand Pebbles, The Andomeda Strain) was signed to helm the project and studio whiz-kid Jeffrey Katzenberg was the producer: All that was needed was a story. One of the scripts submitted by science fiction author Alan Dean Foster for the aborted TV series was selected. It was quickly re-written for the big screen by Harold Livingston, although filming would ultimately begin without an ending. In watching all the documentaries, I noted several discussion of difficulties with the script, but I did not see one person give due credit to the episode of The Original Series (The Changeling, written by John Meredyth Lucas) that seems to be the real progenitor of this story: The Enterprise investigates the destruction of a star system and encounters an alien device that turns out to be an earth probe named Nomad, sent into space where it's been hit by a meteor. It finds an alien probe and the two repair each other, resulting in Nomad becoming a powerful device that now seeks out life and destroy that which is not perfect. This device is said to be "seeking its creator." I remember my first reaction to seeing ST:TMP in 1979 as one of surprise. With all the creative minds that were—or potentially could be—involved in the film, the best they could come up with was a rehash of a television episode that was much more interesting in the first version. "But," as Don Corleone said, "that aside..." This is still some rip-roaring science fiction action in the true tradition of "Pay no attention to the man behind the curtain!" (he says, mixing his movie metaphors viciously...). From the outrageous visuals of the alien device to the 2001-ish space dock sequences to the redesigned Enterprise in all its glory, this is great eye candy and even if does not satisfy dramatically, there is still so much to enjoy. Leonard Nimoy, who signed on late to the movie (causing a replacement Spock-type character to instead die a hideous death, early on), with a multi-layered performance, comes off somewhat better than both Captain Kirk (Shatner) and Dr. McCoy (Kelley) seem to spend much of the movie impatient to get somewhere else; their acting seems somewhat forced most of the time. Scotty (Doohan), Uhura (Nichols), Sulu (Takei), and Chekhov (Koenig) all do their bits with enthusiasm and add much to the movie. I feel like one of the central difficulties is that the writer of the screenplay had little feel for what made Star Trek special and so the spots where the "old magic" was attempted come off as out of synch with the rest of the film. The two new characters central to the actual plot of the movie, Commander Decker (Collins) and Lieutenant Ilia (Khambatta), both perform admirably well in the situation. The Decker character is the son of the Commodore Decker of Doomsday Machine fame, a friend of Kirk's who died battling an alien device...of unbelievable power. Ilia, as a sexually-advanced Deltan, seems to be somewhat of a precursor to what was to become the character of Betazoid Deanna Troi on the Star Trek: The Next Generation series. One would almost think that with the constant repetition of characters, plotlines and themes in all of Star Trekdom, that there is either a serious creative gap in the writing team, or that only a truly finite number of ideas are possible. I am tempted to believe that eventually uncreative thinkers tend to hire uncreative thinkers and generate a geometric creativity vortex in just about any franchise that is successful. Ask Harlan Ellison about that. The visual effects here are dazzling and approach some of the best cinema explorations of space on film. The crew of John Dykstra, Grant McCune, David K. Stewart, Robert Swarthe, Douglas Trumbull, and Richard Yuricich received a well-deserved Best Effects, Visual Effects nomination at the 1980 Academy Awards® (which they lost to Alien). Other Oscar® nominations were received for Best Art Direction-Set Decoration and Best Music, Original Score for Jerry Goldsmith. I did have a personal irritation with the costume design; I did not like the look in general and felt this was a definite case of over-indulgence. I stopped counting the costume changes for Dr. Chapel (Barret) after four, which were even only various bit scenes. It seems like the crew spends a great deal of the short time between the launch from Earth and encountering the alien force changing clothes! The movie seems overlong, as it did in 1979, and terribly self-indulgent, as if the thought was that this would be a one-off and not the kickstart of one of the most successful entertainment franchises ever. The time pressure of the release had to be another serious dampening factor and, no doubt, the films to follow would benefit from the experiences here. Although Robert Wise is a proven director and everyone in the documentaries and commentaries have many complimentary things to say about him, I have always had my doubts that he was really the best man to direct this film. Perhaps, under the circumstances outlined, he was the person responsible for making the film as good and enjoyable as it is. It is a rare privilege for a director to have the chance to make a film better in a new edition (although increasingly less so, it seems) and it is true that this Director's Edition is an improved version, but not remarkably so. Perhaps a C+ movie has been raised to a B- by the changes, because some of the flaws are simply irreversible. In the final analysis, I recommend Star Trek—The Motion Picture highly because, despite its flaws as a film, it is a great DVD. The new enhancements to the cut and details are good fun and have interest to any viewer, as this film is the less-than-perfect foundation on which the Star Trek universe, as we know it now on this side of the millennium, rests and depends. Image Transfer Review: The film is presented widescreen 2.35:1 anamorphic and looks great. However, there is something about films from the 1970s that seems to limit their survivability. I would love to hear from someone versed in the technical aspects of film processing to give a detailed explanation of how films were made in that decade and why they deteriorate so obviously when some older films seem cleaner. There are plenty of flaws in the source, including speckles and black dots that pop up and some scenes have quite a bit of grain. There were some places where the digital transfer revealed some clumsy focus areas of the screen. It's in pretty good shape but this film should probably be marked for restoration eventually. It really needs work. Still, there are some finely detailed sequences that show great color and clarity. As is often the case on DVD, I saw many details that I certainly missed before. 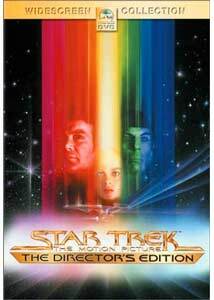 Audio Transfer Review: Here is a place where Star Trek—The Motion Picture shines. The newly remixed and re-mastered Dolby Digital 5.1 sounds terrific and ripped up my speakers throughout the film. Some scenes that I marked for special quality were the early engine room sequence where the hum of the engine was well-placed in the rear; the wormhole sequence,significantly enhanced by surround; going into warp drive becomes a potent auditory experience; and the lightning bolts on the intruder ship. There was a great job done in placing the dialog spatially across the front speakers in relation to the character positions on the screen. On top of that, the Jerry Goldsmith score—an important part of this film that owes much to 2001: A Space Odyssey— is well-placed in all speakers and sounds great. The Dolby Surround is also very acceptable and, besides sounding great on the home theater, lit up my computer's external speakers pretty well! Extras Review: This set sports a very clean and visually interesting menu design that reflects the feel of the film without being annoying and clunky. I found navigation to be easy and intuitive, which made it easy to explore the "Fan"-tastic extras. There is a ton of information and coloration added to the experience of Star Trek in the early 1970s, both on this film and the Trek community as a whole. The first disc has the main feature as well as two separate commentaries. One features director Robert Wise, special photographic effects director Douglas Trumbull, special photographic effects supervisor John Dykstra, musical composer Jerry Goldsmith and actor Stephen Collins in an often fascinating scene by scene description of the right and wrong of the movie. This is another must-have for fans of Star Trek and film tech-heads. A second commentary is the delightful running text provided by Michael Okuda, co-author of The Star Trek Encyclopedia, that pulls no punches as it details some of the foibles of Trekdom and adds other bits of information about the series and its stars. Phase II: The Lost Enterprise (12m:40s): This featurette tells of the period between the end of The Original Series and the release of the movie. The fans, after the success of Star Trek in syndication, clamored for a return to the future and Paramount considered a series and then finally a motion picture. There are interesting comments by Majel Barret Roddenberry about creator Gene Roddenbery's relationship with his own creation. A Bold New Enterprise (29m:41s): Here is a full documentary on the making of Star Trek: The Motion Picture, packed with information and tidbits for fans. Redirecting the Future (14m:07s): Heavily technical description of the enhancements and fixes applied to this release by Foundation Imaging. Trims (5m:46s) is a collection of scenes that were trimmed from the Director's Edition. 1983 Television Production: These are scenes that were inserted in the television edition that are not included in the Director's Edition. Archive contains the storyboards by Maurice Zuberano. All in all, a feast to be enjoyed by all. This set succeeds in many ways. It is a prime example of a director revisiting a film that was rushed to release, without proper post-production, to finally make changes and enhancements that do improve, without just gratuitously adding scenes. Modern technology is used subtly to finish aspects that were incomplete in the original, yet maintain the integrity of the original production. Extras are provided that make the set a treasure trove for fans and also interesting for casual film buffs, especially those interested in the technical aspects of filmmaking. The additional and deleted scenes provide plenty of extra scraps to savor and debate their non-inclusion in what director Robert Wise has declared to be the "definitive" edition. However, all these positive points cannot overcome the fact that, despite being a reunion of a treasured cast of characters and a dazzling technical tour de force, the story told in Star Trek—The Motion Picture is not very original and is too self-indulgent to be a great film. Still, this is great fun and has some real highpoints—highly recommended.